Wild Rye was born from the simple desire to create more stylish options in women’s gear. Ray Gadd Photo. On a week-long hut trip in the Selkirk range of British Columbia, Katy Hover-Smoot begrudgingly threw on her ill-fitted and unflattering baselayer. She didn’t really have a choice to wear anything else, because in 2013 there weren’t many options for women’s gear. The selection became even more sparse when she ventured into the world of mountain biking. Here, she only could find shorts that made her feel like a package of sausages in tight plastic wrap. It was a dilemma worth addressing, but she wasn’t sure how to approach with no formal apparel design background. Instead, she had a Ph.D. in art history from UC Berkeley and four years of experience from Specialized Bicycles. Three years later, unable to shake the idea from her head, she launched Wild Rye. Luckily she wasn’t alone with her sentiments about women’s gear. An old friend of hers, Cassie Abel, had also taken a big leap by leaving her job at SMITH optics to create her own PR Agency. As with any entrepreneur endeavor, Hover-Smoot needed help but quickly realized that she couldn’t afford to hire Abel for her PR services. Cassie, who also long believed that women deserved more options, had a better idea in mind: she suggested to become a partner of the company. In 2016 the two joined forces to launch Wild Rye and haven’t looked back since. A brand that began with bike shorts adorned with dinosaurs and pineapples has steadily grown to include jerseys, chammys, and even base layers for the winter. We caught up with the two entrepreneurs about of their insight in managing a small but growing apparel brand. Hover-Smoot drew inspiration for Wild Rye from what she loved most: skiing and mountain biking. Katy Hover-Smoot Photo. KHS: My background is a bit different. Before Specialized I got a Ph.D. in Art History and always thought I would work in academia as a professor. CA: My first job out of college was in investment banking. When I left that role I was helping Boulder’s club lacrosse team and would coach on the weekends. That ended up leading to a full-time varsity coaching position at UC Berkeley. I did that for a year and while I loved the experience, quickly realized it wouldn’t be my lifetime career. I ended up taking a job with a marketing agency in San Francisco and handled the account with VISA. What led you to the outdoor industry? KHS: Honestly? It was just the reality of the academic job market. I was staring down a decade of moving to towns and cities I didn't like for assistant professorships or adjunct jobs that may or may not lead to a tenured position, and none were in California. I knew that staying in the state and staying close to the mountains was important to me, so I chose geography over a job. Ralph Ellison is often credited with saying "geography is fate," and while he meant it in a very different context, I agree with the axiom. CA: My dream my entire childhood was to work for SMITH, having partially grown up in Sun Valley. I wrote my senior thesis in college about market segmentation and branding in the ski industry and did case studies on SMITH and K2 Skis because I also grew up on Vashon Island where K2 started. It was one of those things where I always dreamed of it, but the skills I learned through all of my jobs led me to being able to make an impact at SMITH and even be considered for the job. Creating Wild Rye and White Cloud Communications was Cassie’s way of staying in a place she loved. Jay Dash Photo. Neither of you has a formal background in apparel design correct? KHS: Cassie and I came from big brands [SMITH and Specialized] where the people who founded those brands were not themselves industrial or apparel designers. We really felt like we ourselves had the skills we needed to get a company off the ground, but we also knew we needed the right people to get to there. CA: Neither of us are designers by trade, however, we have spent a lot of time critiquing apparel in addition to using and abusing apparel. What was lacking in women’s apparel? KHS: When it came to bike shorts and base layers I always found that the fit was too tight. I spend most of my winter skiing, so by the time mountain biking season rolls around I’ve got strong thighs and shorts would never fit. As a size six I remember having to order an extra large mountain bike short and it was still too tight. Then there’s the issue of colorways. As a woman, you get three options: raspberry, teal, and black. That’s it. CA: The biggest hole was absolutely in mountain biking, which is why we launched our bike gear first. We both operated in and around the bike industry and attended a million Interbikes and felt like there were 10 women to every 1,000 men on the show floor. We found that to be especially reflected in product and marketing throughout the industry. Buying shorts sizes would vary drastically, some days a medium would work and others an extra large would be too small. Overall it lacked consistency. The Mauna Kea base layer is a cozy and warm base layer inspired by the snow atop Hawaii’s highest peak. Ray Gadd Photo. How much of a small business is problem-solving? KHS: It was definitely problem-solving as we went, but I could not imagine trying to start a business before the internet. We’re so fortunate that we can Google practically everything now, which is incredibly helpful. It also helped that we both came out of these bigger companies so when we had questions about how these things worked we actually had people who we could call. We’ve had a lot of help along the way, and that’s really how we got ourselves off the ground. In the beginning, you really don’t know how to start, so we just went for it and hoped for the best. What appealed to you about starting a small business? KHS: Coming from an academic background I knew I always wanted to be my own boss, in comparison to working in the traditional corporate structure. I much prefer being my own boss and was looking for ways to control my own life and live in the Sierra Nevadas. CA: I never thought I would be an entrepreneur, but the coolest part about it is building something and learning. In a corporate world you have one position and you do the duties for that role, and I know I’m oversimplifying it, but with Wild Rye, I feel like I’m learning something new every day. I’m one of those people who loves to learn, network, and gain more perspectives and that’s been the most exciting part of this. It’s definitely a choose your own adventure. For me too, living in a small community I enjoy being able to give back to my local economy and create career opportunities for young professionals. The Mauna Kea even comes in leggings. Ray Gadd Photo. What really strikes me about the product is the level of thought put into it. Can you speak into that? KHS: The actual fit process for us is actually pretty complicated and in depth. We fit on women who are active athletes and we try to fit across at least three body types. For example, we pick one size but we’ll try to get three different body types—whether it be tall, short, or pear shape—that identify as a size six to fit within our sample size. We do that because we want to make sure making a garment that fits everybody as best as we possibly can. That actual detail and design work stemmed from the quality that we were looking for, and I think that’s reflected in our price point. A lot of what you’ll find in mountain bike apparel is polyester, which is neither durable or breathable. We use nylon instead, which is much sturdier and is also recycled. It’s a great material. The same goes for our baselayer, we use 17.5 micron which is within reason one of the highest quality microns you could use. I guess you could go to 15.5 microns but that’s basically a Burberry turtleneck. Overall our focus was to create something ultra soft with a more modern cut. CA: For the modern outdoorswoman I’ve seen a lot of women deterred from participating in these sports because they feel like they look ridiculous or things fit weird. They’re just not comfortable and we wanted to change that. So at times, we do look to the runway for prints and colors. You didn’t realize you needed a pair of pineapple bike shorts until now. Ray Gadd Photo. Let’s talk about the patterns: dinosaurs, pineapples, and cactus. What was the inspiration there? KHS: Cassie always jokes that our shorts are super “New England-ly” because of the small repeated style that we use. We were more interested in creating a sophisticated print. 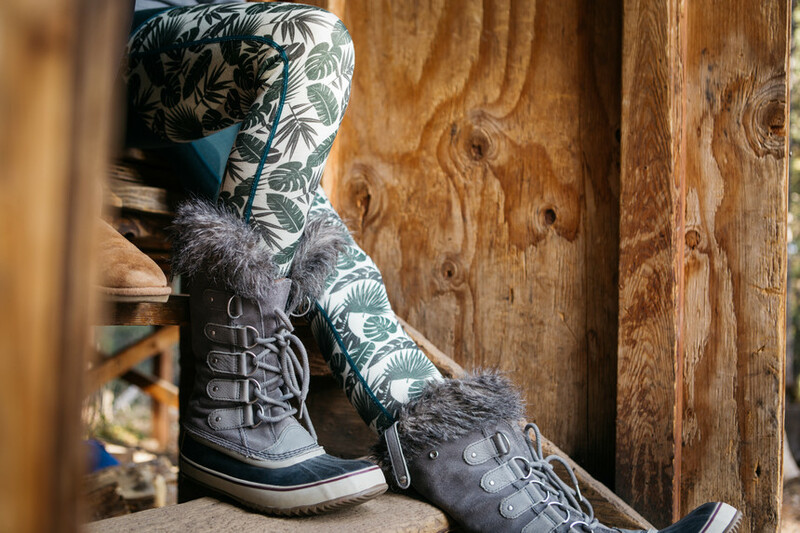 With the base layer, we knew we wanted to do something fauna-based and we had been toying around with palm prints. When we discovered the dark green main body color, which was so sophisticated and different from the norm, we wanted a print that suited that colorway. Wild Rye is happy to stay focused on soft goods, it's a category of the industry that still needs to grow for women. Ray Gadd Photo. How would you like Wild Rye to grow? KHS: I’d like for us to diversify our offerings across price points. I don’t think technical outerwear is in our future. We’re primarily a soft goods company because that’s part of the industry that’s so overlooked. I’m also interested in growing our footprint with small local shops. CA: Beyond selling more product, I see Wild Rye being a brand for every community, and a reason to bring people together. Is Wild Rye your guys’ full-time gig? KHS: I do run Wild Rye full time while working another full-time job. I actually teach art history at our local college [in Lake Tahoe]. I have 200 students across all my classes, so it’s hard but we’re not at a point that the business is big enough to pay ourselves. We still have to make money and I’m lucky that teaching is super flexible. We’re both working like seven days a week, but that’s how it goes in the beginning with a small business. CA: No Wild Rye is not my full-time gig. I run White Cloud full-time and then put in close to full-time Wild Rye hours on top of that. Thankfully I have a great team with my PR Agency, White Cloud, and I trust them with everything. I think the best businesses are run when you surround yourself with good people and knowing you can’t do it all.